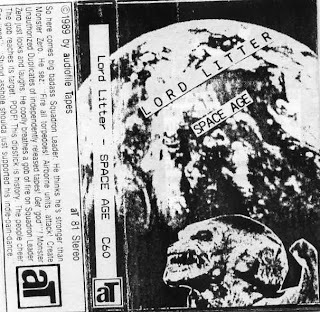 It is difficult to write about Lord Litter because he`s been around for a long time in the european underground scene producing a large amount of tapes+cds, he has been collaborating with many artists and also he is a very skilled dj involved in few radio stations since long time. Those two tapes are old and are not listed on his webpage. "The place where worlds collide" is a selection of released and unreleased songs from 1984 untill 1992,edited and distributed by Joukkomurha Productions in Finland in the mid 90s. "Space Age" is a cassette released by the legendary Audiofile Tapes (Usa) in 1989. Both tapes bring us his own personal style of writing and producing music and if one might be close to some "summer of love" music of the late 60s the other is instead near to the space rock of certain low-fi movies in the late 70s. All in all Lord Litter is a weird genius of our time passing throu different layers of counter-culture and crossing the borders of time and space to deliver us a creative and innovative music that stands on its own. A must for the lovers of original music.